Mazel Tov! Your formerly little boy or girl is now ready to become a man or woman! 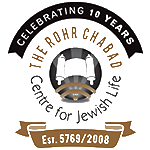 Chabad offers Bar/Bat Mitzvah preparation and services. The course runs for 12 45 minute sessions, during which the fundamentals of Judaism and Hebrew reading will be covered. For the student to be fluent in Hebrew reading, practicing at home is essential. Cost for the course: $500, payable to Rabbi Goldman. The actual Bar/Bat Mitzvah service does not have a fee, but a donation to Chabad is encouraged according to one's means. Please contact us at least one year before your child's big day to allow for proper scheduling. Click here to calculate the Hebrew date of your child's Bar/Bat Mitzvah.